Our Vision is to create world citizens with humane values by facilitating learning in a progressive and inclusive ambience and to enhance the inherent potential of all the stakeholders. By recognizing that schooling is about each individual child and not about the system. By designing all learning in such a way that children are absorbed in and excited about their schooling experience. By understanding that education is the development of the whole person, the mind, the body and spirit. By finding and supporting teachers who love children, love teaching and are capable of inspirational leadership. By ensuring that the school is connected to parents, the local community and the world at large. The school is taking shape with a close partnership with iDiscoveri Education - a social enterprise with the expertise and passion for education. iDiscoveri will create an innovative framework for the education delivery and student development in the NH Goel World School. 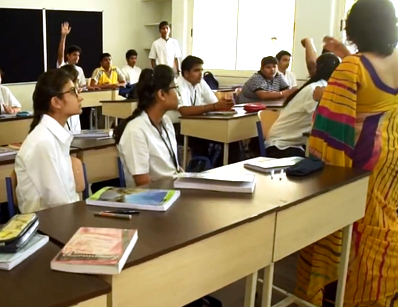 iDiscoveri, India’s leading social enterprise has created the school’s innovative frame work for the education delivery and student development. iDiscoveri will train the teachers and monitor the class room teaching learning practices and will give regular feed back on curriculum transaction. efforts anew and strengthen the ties that bind us together to serve a cause greater than ourselves. “N. H. Goel World School is devoted to creating responsible world citizens.